It's the deepest part of winter, the exact midpoint, Christmas Eve – halfway out of the dark. Amy and Rory are trapped on a stricken space liner that's plummeting through banks of thick icy fog to the surface of the planet below. Only one man has the power to save them; only one man is in possession of a machine that can clear the fog and let them land safely. The Doctor's only chance of rescuing the ship's four thousand passengers is to save Kazran's soul and show him that life is worth living. For this he needs to go back, way back, to when Kazran was a boy with a life full of promise. But can the Doctor put a song in Kazran's heart and love in his life, in time for Christmas? Can he bring him out of the dark? The thrilling adventures of the Eleventh Doctor (Matt Smith) and newlyweds Amy Pond (Karen Gillan) and Rory Williams (Arthur Darvill) will continue in a Doctor Who fun-filled and heartfelt festive story, A Christmas Carol, this Christmas on BBC One. 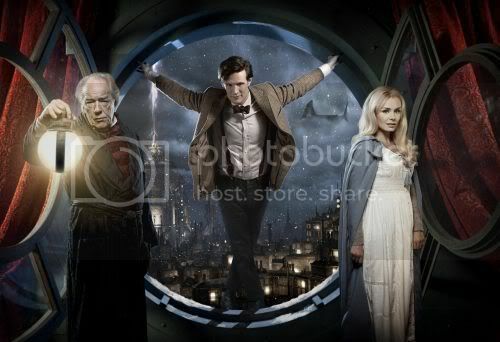 In the grand tradition of Doctor Who Christmas specials, this year the show has once again attracted stellar guest stars, as veteran actor Michael Gambon (Harry Potter, The Singing Detective) and Opera diva Katherine Jenkins, in her first acting role, join the Time Lord for what might be his most Christmassy adventure yet! On winning her part, Katherine Jenkins said: "I'm over the moon to be involved in the Doctor Who Christmas Special – I can't quite believe it as it's a part of the family tradition at the Jenkins household. I heard the news that I got the role on my 30th birthday and it was the best birthday present ever!" About the series, Lead Writer and Executive Producer, Steven Moffat, commented: "Oh, we're going for broke with this one. It's all your favourite Christmas movies at once, in an hour, with monsters. And the Doctor. And a honeymoon. And... oh, you'll see. "I've honestly never been so excited about writing anything. I was laughing madly as I typed along to Christmas songs in April. My neighbours loved it so much they all moved away and set up a website demanding my execution. But I'm fairly sure they did it ironically." The Christmas special follows on from Matt Smith's first series as The Doctor, which attracted huge critical acclaim for Smith, his companion Gillan and lead writer Moffat, from press and legions of fans alike. Ben Stephenson, Controller, BBC Drama Commissioning said: "Matt Smith and Karen Gillan captivated audiences in their debut series, and Doctor Who's clever twist on the much loved A Christmas Carol will thrill BBC One viewers this year with special guest stars Sir Michael Gambon and singing sensation Katherine Jenkins joining Amy and the Doctor for an unforgettable present!" The series was commissioned by Ben Stephenson, Controller, BBC Drama Commissioning for BBC One. Steven Moffat is Lead Writer and Executive Producer with Piers Wenger and Beth Willis also executive producing. After his critically acclaimed and hugely successful debut performance as the Doctor earlier this year, Matt Smith hasn't had time to rest on his laurels because in July he found himself surrounded by snow, shooting the Christmas Special. Here, Matt explains what festive fun lies in store for Doctor Who fans. "I've always wanted to be part of the Christmas Doctor Who experience," reveals Matt, "And I think this is certainly one of the most Christmassy and inventive Doctor Who stories so far. "Steven just keeps getting even more imaginative and the great thing about this episode is that when Doctor Who and Christmas are put together you combine the spirit of both those things; it's a fun old yarn and the Doctor simply loves Christmas." At the end of last series, Rory Williams officially became Mr Pond and joined his new wife Amy and the Doctor for more time-travelling adventures in the TARDIS. So where does this episode pick up? "Well, it starts off with Amy and Rory on honeymoon, but the spaceship they are travelling on gets into trouble and needs to make an emergency landing on a nearby planet," reveals Matt. "However, they are blocked from entering the planet's atmosphere and with the ship nearing implosion, the Doctor has to try and work out what's going on and how to save them. "Steven's fantastical and magical mind has been working overtime and he's been extremely clever with this story," continues Matt. "It feels very Dickensian, set in a mad futuristic world and it evolves into something even more magical than your classic monster Doctor Who episode." However, Matt's quick to point out the episode does still feature a creature that is bound to get both children and adults alike cowering behind the sofa. "The episode features a wonderful shark which I was very excited about," reveals Matt. "I've always wanted to explore the aquatic; viewers can expect Jaws with a twist!" Joining the cast regulars in the episode is acclaimed actor of stage and screen Michael Gambon, and superstar opera singer Katherine Jenkins, making her acting debut. "It was a real privilege to work with Michael," explains Matt. "I had a great time with him and he was really naughty! He's so crafty and when I asked him about working with iconic actors such as Olivier and Bates he said the one thing they all had in common was they were naughty – and he's exactly the same. He was very mischievous, constantly telling jokes and getting into the spirit of play. "With Katherine I was astounded by her professionalism. Considering it was her first acting experience I thought she handled it with real craft and diligence." continues Matt. "It's exactly the type of casting we want; someone fresh, exciting and new." But can Matt reveal anything about who they play and how they fit into the overall story? "Well," chuckles Matt, "I can reveal that Michael plays a scrooge-like miser but there's a time-travelling twist to it all. To play an old grump there is no one better than Gambon. However, Michael also really makes you feel for this man and he can somehow turn himself into a little boy at times; he's a very impressive actor. "Katherine looks like a princess," continues Matt, "and boy can she sing; the way she controls her voice and the grace with which she sings is quite incredible." But while the Doctor is off on a Christmassy adventure, what will Christmas day hold for Matt Smith? "I'll be watching Doctor Who with my family of course!" laughs Matt. "I imagine we'll have a big lunch first and then we'll sit down to watch the episode; the Doctor even gets to come down the chimney!" Welsh mezzo-soprano Katherine Jenkins has achieved worldwide fame with her stunning singing voice and has performed in countries across the globe. However, it was her acting debut that made her most nervous. Here, Katherine reveals what it was like to star in the Doctor Who Christmas Special. "To be honest, I didn't think I really wanted to act," confesses Katherine. "I'd been asked to do things in the past and hadn't done them, but when I got the call to do Doctor Who it really excited me. "It's such an iconic show and one we all watch as family. I wasn't sure I could do it but after reading for the part, I got a call on my 30th birthday to say I'd got it. It was the best birthday present I could have asked for!" Stepping on to set for the first time can be a daunting experience for most actors, so how did Katherine feel when she joined the rest of the Doctor Who cast on her first day of filming? "I had the most amazing time," reveals Katherine. "I must admit I was very nervous and I felt out of my comfort zone because I hadn't done any acting before. However, when I arrived on set the whole team was so welcoming and supportive. They made me feel like I could do it." Set on a futuristic planet that looks very Dickensian, this Doctor Who Christmas Special is set to be the most Christmassy yet. Katherine explains: "It certainly felt very Christmassy when we were filming it in July! The story is very emotional which I hope is going to touch people. I play the part of Abigail, a young woman who has been frozen in an ice chamber. "Needless to say I do get out of the chamber but viewers will have to wait and see what happens to my character. "I do get to sing though which was nice and I had a really good laugh with Matt between takes. He kept mucking around and singing to me but you know people should hear his voice; I think he's got a great bass voice!" Speaking about her costume Katherine reveals: "My character comes from a family with really no money so my dress is very simple; it's a long cotton and lace dress with woollen sleeves and I also wear boots. It's almost looks like many layers of Victorian underwear!" Doctor Who is predominately filmed in Cardiff so Katherine also had the added pleasure of catching up with her family during gaps in filming. "It couldn't have worked out better," explains Katherine. "My family are based in Wales so some of them came to the set and I got to catch up with everybody, which was nice." Since filming wrapped on the Doctor Who Christmas Special Katherine has been extremely busy concentrating on her music career. "I'm on tour, visiting Denmark, Germany, Australia and America," reveals Katherine. "Then I'll be performing at the Royal Albert Hall before heading to Afghanistan over Christmas. To kick off 2011 I'll be working on my eighth album." But has Doctor Who given her the acting bug? "It's not something I'd ever done before," explains Katherine. "But I really enjoyed it so maybe in the future I'd consider other opportunities; although I think it would help if the role had a musical element to it!"